What Do You Understand By Document Review Services? What Do You Understand By Document Review Services? What Do You Understand By Document Review Services? A written material related to different types of cases is reviewed by the attorneys. This process of reviewing is called the Document Review Services. It is a staple kind of work where the documents vary depending upon different types of cases. In some serious cases where a large number of documents are to be reviewed in a particular period of time, the law firms eventually seek help from the document review service providers. Internal audits, internal investigations, and different litigations are basically reviewed by service providers. Documents are often found in different forms. Though the attorneys check the hard copies, now in the era of electronics, native files and soft copies are also checked and reviewed. Soft copies are usually used when the company needs to keep track of the document and passes it through different software. The machine learning and e-discovery process are used when a large number of electronic documents are reviewed. The total process of document reviewing can be such expensive and meticulous one that a law firm may need additional assistance along with their present resources. Sometimes even the attorneys are hired from outside. Why Do You Need a Document Review Services Providers? 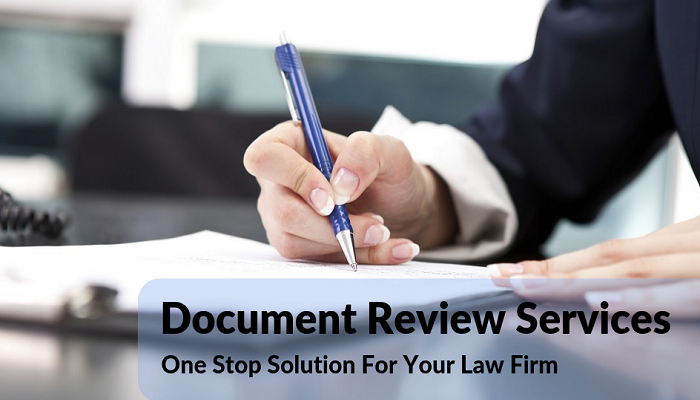 The higher international law firms need to get associated with the Document Review service provider to avoid multiple failures to meet the deadlines, to lower company expenses, to enhance the business and to stop hiring expensive law attorneys from outside. To record the valuable documents, the law firms often need e-discovery, which can be totally taken care of by the Document Review Service Provider. The legal staffing companies, basically to stay competitive and reduce the cost rates, are stooping down towards Document review service providers. Such Indian providers are excellent and specialized at sections like- documents coding, e-discovery, and legal outsourcing processes. The offshore opportunities provided by international law firms are very flexible in India. You get very efficient, productive, serious, knowledgeable attorneys and working professionals here at a very cost-effective package. They aren’t only reviewing the legal documents but also can take care of your other legal litigations. You get timely assistance with free client counseling in every possible way out to different problems or complications. Our company Legal Support World is not an exception. We proudly declare ourselves as very sophisticated document review services providers. Our only aim is to come up with our very potentials, day in and day out & provide you with the best service ever. We establish our Documents Review guidelines and facilitate our work with meticulous supervision. It is evidently money saving for you and at the same time establishes a proper reputation for your company. We are dynamic in terms of professionalism and work culture. Our 24 * 7 client-friendly services are easy and attractive to opt for. We have been a name in this field not because we publicize but our work and past record make us credible to all our clients and business partners.